“FlightSafety’s new and innovative MissionFit interactive training system will set a higher standard for efficiency, flexibility and cost effectiveness. It is designed to meet the on-site and remote training requirements of government and military agencies and commercial aircraft operators. 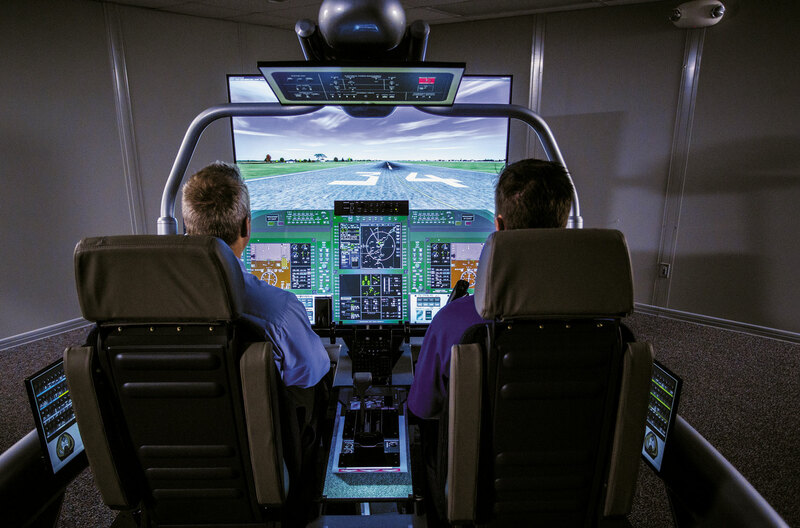 This ground-breaking training system further enhances FlightSafety’s leadership in aviation training and simulation technology,” said Ray Johns, Co-CEO, President, Government and Manufacturing. The design and development of MissionFit was led by a cross-function team of simulation engineers, courseware developers and training delivery experts based on input from FlightSafety’s commercial and military Customers. The unique and highly flexible design of MissionFit includes an innovative seamless glass display featuring a graphical representation of an aircraft’s flight deck sensitive to movement and touch, uninterrupted by bezels and integrates with wireless tactile panels. MissionFit is designed to be reconfigured and updated using cloud technology. It can be outfitted with flight controls, power control levers, tactile and wireless smart panels, and a visual system to match a wide range of training needs. Aircraft type-specific AFCS mode select panels, throttles, gear and flap handles, cursor control devices and multi-function keyboards are easily added. MissionFit can be set up in minutes and operated in a mobile container, aircraft hangar or office area, and is powered by a standard electrical outlet. MissionFit will be featured at FlightSafety’s booth (#1401) during the upcoming Interservice/Industry Training, Simulation and Education Conference (I/ITSEC) in Orlando, Florida.